New Dell SC9000 – Revolutionary or Evolutionary? Dell released the Dell SC9000 at Dell World 2015 in Austin TX this week. The SC9000 is the new high end Compellent controller, a space currently occupied by the SC8000. Much of the messaging I’ve consistently heard around the new Dell SC9000, however, is that it is not a replacement for the SC8000. In fact, the SC8000 will continue to be available side by side with the SC9000 for quite some time. The new SC9000 has a lot of improvements over the previous controller from a hardware perspective, but it is really a discrete offering? Or is it really just a refresh? The new SC9000 controllers are based on the Dell R730 rack mount server product. The R730 is a 2U, 2 CPU server and a common virtualization workhorse in the server space. 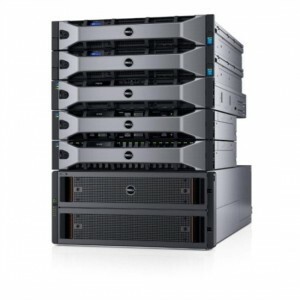 By contrast, the SC8000 is based on the Dell R720 server product, which is the previous generation of the R730. There are a few differences in the configuration of the SC9000, however. The SC9000 will have dual Xeon 3.2Ghz 8 core processors. It will come with double the memory per controller, with 256GB instead of the 128GB max in the SC8000. Front end connectivity options are unchanged, and include 4/8/16Gb FC, 1/10Gb iSCSI, and FCOE. Max drive count is currently unchanged, at 960 total drives. I expect this to increase in a future firmware release, based on the increase in RAM if nothing else. The SC9000 has the same amount of expansion slots as the SC9000. So, from a controller hardware perspective, it is literally a next generation refresh of the SC8000. One more notable change is the new cache card hardware. The SC8000, today, is using a proprietary PCI batteryless cache card. The SC9000 will be shipping with an off the shelf PCI card that looks an awful lot like a dual port 8GB FC HBA with super capacitors and 4Gb of onboard memory. The built in FC connectors on this new cache card will serve as a dedicated IPC for cache mirroring between the systems. This is a huge increase in write cache for the Compellent, but it also simplifies IPC configuration, which has traditionally used backend SAS connectivity or front end fibre for the IPC traffic. This is definitely a welcome and long awaited improvement vs. the CHA cards in the SC8000. Still seems like a pretty evolutionary upgrade, right? Whats the big deal here? Well, it has twice as many SAS ports. The current 6GB SAS enclosures, such as the SC220, only have 2 SAS ports per LCC. Typically, these are cabled so that each port provides connectivity to a different controller. 2 ports for 2 controllers. Makes sense? I think we are left with our imagination as to the potential future use of these extra ports. To me, this foretells of something revolutionary, not just an update. The new SC9000 will be the first place you can get SCOS 6.7, which will be the code it ships with. 6.7 will become available on the other products including the SC8000 and SC4020 in the coming months. This version includes some really cool new features. Did you read my article on thin-import? No? Go do it now here. Ok, up to speed? When I wrote that article, thin-import was only supported for Fibre Channel connected storage arrays. SCOS 6.7 introduces support for the first iSCSI based import, which will be specific to the Equallogic PS Series. This will make a migration from the Equallogic products to the Compellent products much easier. What I”m really interested in trying is if it will work for other iSCSI arrays too (even if not officially supported). It should, unless they’ve artificially restricted it in some way. Another new feature in SCOS 6.7 include Live Volume Auto Failover! This is the feature many Compellent customer have been hearing about for years, and its awesome that its finally here. The initial release will be supported for VMware only, and will allow automagical failover between geographic sites. This is built on the new Live Volume Sync updates that were completed in recent previous SCOS releases. Really cool stuff. Unlike competitive products in this space, Live Volume requires no external appliances, no host side software or write splitting. Simple 1 click setup. One other feature I”ll mention is data reduction on all-flash arrays. In previous versions of Compellent, it would only do data reduction on spinning disk. If you had an all flash system, it wasn’t doing any data reduction on that. Version 6.7 changes that. Yay! This is a free feature which will automatically save money for the customers who upgrade. So, is the SC9000 really so different from the SC8000 that we should be suggesting it as a discrete product that is not a replacement? No. Its a product update. We can see some hints in the hardware and software, however, of new things to come that will really be revolutionary. Want to learn more about any of these features? Let me know below.